These macarons make me smile. Inspired by a seasonal offering from Williams-Sonoma, they were an experiment of mine to attempt a red velvet macaron flavor and I am more than pleased with the result. Red velvet is very much an elusive flavor to describe. Technically, it's a buttermilk cake with a hint of cocoa and of course, the excessive red food coloring. The frosting also adds to the red velvet experience and can range anywhere from cream cheese frosting to vanilla sour cream or even a more modern twist - cinnamon buttercream. 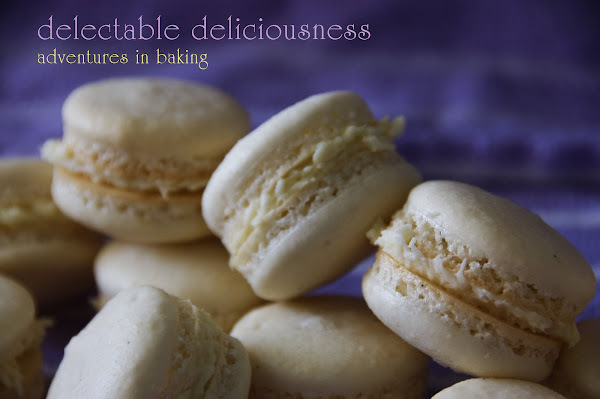 The latter is what I chose for these macarons, as I have used it previously on a red velvet cake for my mom's birthday that was met with rave reviews. The recipe comes from Baked, a well known bakery in Brooklyn that I had the pleasure of visiting last September. I tried a few of their cupcakes, including a red velvet, and while the cake was a bit on the dry side (perhaps it was due to my late in the day visit?) the frosting, oh the frosting! Every single one of them was divine. Not overly sweet at all and deliciously creamy. I'm usually the one to scrape off most frosting on baked goods piled high (as is usually the case with cupcakes) but theirs was so good I didn't dare. While a cinnamon buttercream may not be traditional for red velvet, I think it is an excellent modern twist on an old classic that has seen a resurgence. To make a macaron red velvet, I simply modified a recipe I'd used before (employing the Italian meringue method) by adding a bit of cocoa powder. I was hoping to add a hint of cocoa flavor to the shells without turning them brown or chocolate flavored, however, there wasn't any hint of cocoa to be found. Had I added more I don't think the food coloring would have covered up the brown tint, though I may experiment more in the future with this. All in all, I am still very pleased with the final result. I love the cinnamon buttercream with these but would think that a cream cheese frosting would go just as well with them. **EDIT: I found a great new blog dedicated to these lovely little sweet treats called Mactweets and will be entering these in their Mac-a-Valentine round up. Check out! A little note on this recipe - it makes A LOT. I easily filled 3 sheet pans worth. Also, please do yourself a favor and use two pastry bags for the batter. I made the mistake of only using one; I thought the 16-inch size I had would suffice but I ended up overflowing some batter while filling the pastry bag and then also had batter oozing out of the top and all over my hands. Lesson learned! Sift together the almond flour and confectioner's sugar. Mix in the egg whites to create the "mass" (mixture will be very thick). Add in your desired amount of red food coloring and mix well. Note: I didn't measure the amount I used, I just kept adding until I had a bright red color, keeping in mind that the color will be diffused a bit when the Italian meringue is added. Fold in 1/4 of your meringue mixture into the TPT "mass" to lighten the mixture. Gently fold in the remaining meringue until the mixture "flows like magma". Transfer to two pastry bags with a plain tip. A note on how to pipe heart shaped shells: This takes some finesse. I started out with heart shapes drawn on parchment underneath my silpat which helped somewhat. This particular batter was more 'oozy' than the French meringue method I typically use, so it was a bit difficult to pipe them exactly into the shapes I traced. I ended up piping them freehand in a gentle 'V' shape that turned out well. Allow for shells to dry at room temperature for at least 30 minutes (I almost always wait 1 hour) then bake at 350F for 12-20 minutes (depending on your oven). I just bought very similar little boxes..and have egg whites on the counter..but I will never see macarons as heartstoppingly "amoureux" as these.Honestly.. 6 stars. I can't believe you have only one comment so far. These macarons are so original and beautiful!!! You did a fantastic job!!! Thanks for the tips! This is such a cute idea! So adorable. these are gorgeous, and so cute! i love how red the macaron shells turned out. Incredible photos and presentation... so many perfect hearts! I wish someone would do a video tutorial on making macarons! These are divine! AMAZING job!! I am so impressed and inspired!!!! These are adorable. I am toying with the idea as well ... eggs are aging now! I was thinking I would have to free-form it as well I normally use a 806 for a round mac. What size tip did you use? How cute and festive for Valentine's Day. beautiful!! its so hard baking macaroons, and yet yours turned out perfect little hearts! Absolutely gorgeous Jayme...a labour of love! I have a hard time turning out round ones with feet, can't believe you got such pretty & perfect hearts! SPOT ON for Valentines. Thank you for joining us at MacTweets. It's wonderful to have you there! Those are some of the prettiest mac hearts I've ever seen..and to make them red velvet, with that luscious cinnamon buttercream filling is just..wow, I'm speechless! Beautiful photos too! gosh youre piping skills are awesome! producing uniformed heart-shapes one after another. good job =) and i love the colour btw. Wow these look great! I love the idea of red velvet macarons, it is my favourite flavour for cupcakes! and wow your piping is fantastic, I have enough difficulty getting circles! These are phenomenal! Just gorgeous! Stunning. Beautiful. Just gorgeous!! I love the cinnamon buttercream. I know I'm late coming by, but just wanted to say that these are the most gorgeous Valentine macs ever! Fabulous color! Oh my goodness!!!!!!!!! Let me just say: COME MAKE THESE FOR ME! They look beyond tasty. I wouldn't even want to eat them, but probably wouldn't be able to help myself! I can't believe you made these, they look absolutely incredible!! Wow!! I definitely wouldn't want to eat them, I think they'd have to sit prettily under a bell jar! Really, really cute macarons! You've inspired me to try at some of my own. One question though...when you're piping the mixture...how big is the heart? Hi! These are gorgeous! Quick question, I want to make these for Christmas, can I make them ahead and keep them indefinately or do they have a shelf life (before filling of course)! Thanks so much! Gorgeous! Cant wait to try them out! These are great! I tried to make the shells but making the heart shape is hard. And I couldn't get the RED color. I didn't know how much to put and I kept adding a lot of the red gel coloring. But still pink. But I didn't want to put the whole little bottle in there so I stopped. Just found these, they are beautiful! What brand/color of gel coloring did you use? I have tried to make red ones before and just kept getting pink, definitely need a different color and would love your recommendations! Thanks! So pretty! I am totally impressed with how nicely they turned out! Gorgeous!wish I had a steady hand to make round macroons...I am inspired!Is there any difference using powdered coloring? Those macarons are so gorgeous! I can't wait to try out the recipes and hope that they'll turn out as gorgeous as yours! Beautiful work. I wanted to feature this in my blog & pin this but cant see any button. Please email me getintopining@gmail.com. Hi, I saw your photos and loved them. I'm looking for a good red food color and was wondering which color - and by what company - you're using. Thank you! These were great! Thank you so much for sharing the recipe - I especially enjoyed the cinnamon buttercream which was lovely to work with. Can you tell me what you use for the almond flour? I used Bob's Red Mill which I found too gritty despite puting it in the food processor with the confectioner's sugar, and then forcing it through a tamis. Any hints would be appreciated. Actually, I just put together an infografic on "Led designing and led lighting". I was looking for some information on "Web Development And Design Blogs" this morning and came across your article: "20 Rising Web Development And Design Blogs To Follow In 2017". nice post. i would like to share https://www.dsapone.com/new-york/manhattan/stone-services/cleaning-granite/ for best granite cleaning service. Thank you for the post and it is very useful. We can also use the other natural oils like Cold Pressed Groundnut Oil Bangalore for the strong and a healthy life. Custom wink Shirts Manufacturers in Chennaiwill let you with some of the suggestions over the clothes or fabric that will help the individual to be with the comfort zone. 8months,https://buyundetectablebills.com/contact-us/ ,Buy 100% Undetectable Counterfeit Money . Thank you for the post shared with us. It is informative and interesting keep sharing the nice post. Thank you.